Tales of Gods and Madness: FUNNYBOOKSINREVIEWAREGO!! – Dork Forty! Home » Comic Books » Tales of Gods and Madness: FUNNYBOOKSINREVIEWAREGO!! Well, honestly, it wasn’t that long ago. A couple of years, maybe. That was when the book got relaunched with a cool new setup by Warren Ellis and Declan Shalvey, who gave us Moon Knight as a high-functioning super hero lunatic with slightly different personalities and costumes depending on what kind of case he was on. They did six issues of that marvelous craziness before moving on to the even-better Injection, and I pretty much followed them on their way out the door. The storylines that followed seemed less interested in taking advantage of Ellis’ new status quo than they did in dismantling it, which struck me as kind of a shame. 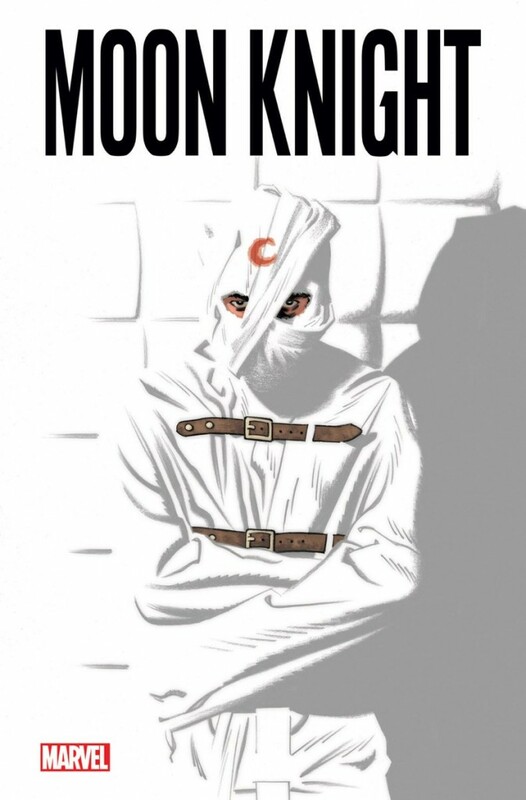 This new relaunch continues in that vein, with Marc Specter waking up in (as the cover might suggest) an insane asylum, where he’s routinely beaten by evil orderlies and is being told by his psychiatrist that he was never Moon Knight. So it’s an “everything you know is a lie” kind of story, an elaborate super hero gaslighting handled with aplomb by Jeff Lemire and Greg Smallwood. It’s kind of a relief to me to see Lemire writing a work-for-hire book that’s actually good. I’ve long been a fan of his work on books like Essex County and Sweet Tooth, but every licensed comic I’ve ever picked up by him has been beyond horrible. Of course, all of those were done under the Bob Harras editorial regime at DC, which might say more about the creative direction of that company than it does about Lemire’s talent. Not that this issue set my world on fire or anything. It’s well-done, but I’ve seen these tricks before. In movies, in comics, on TV… It’s an unusual, but still well-worn, story idea. Lemire and Smallwood’s take is still engaging, though. Cast members dating back to the original Doug Moench/Bill Sienkiewicz run make appearances, and Specter’s having some pretty great hallucinations along the way, too. 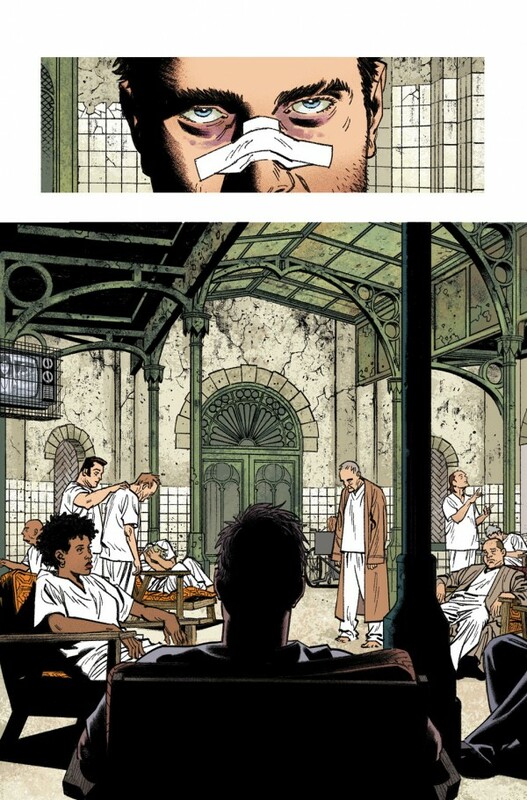 Greg Smallwood’s art is a nice draw, as well. His work strikes me as sort of a cross between Lee Weeks and Alex Maleev: solid realistic illustration chops paired with a penchant for photo-realist detail. It was Smallwood’s art, in fact, that convinced me to shell out my five bucks to read this thing. It’s an extra-length story, too, so that didn’t hurt. But I was on the fence about it, and the pretty pretty pictures are what pushed me over the top. So that’s the new Moon Knight: not the best funnybook ever, but interesting and entertaining enough that I didn’t feel like I’d completely wasted my money. 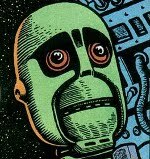 I don’t know that I’ll be back for issue two, mind you. But while I was reading, I was reasonably entertained. I think I may have been selling this book a bit short. I mean, recent issues encouraged that. 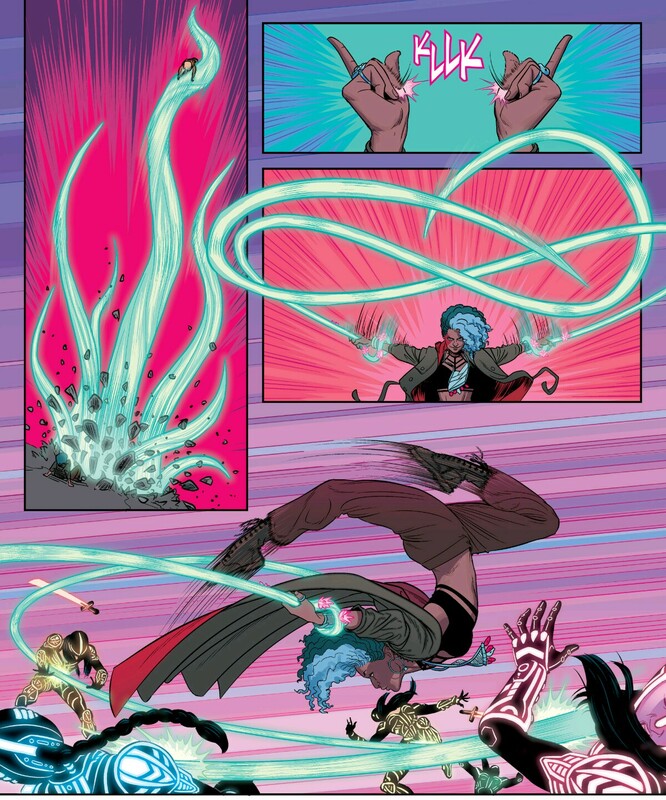 The “Commercial Suicide” arc, despite some nice guest art from the likes of Tula Lotay and Brandon Graham, mostly just served to prove once again something I’ve long thought: the team of writer Kieron Gillen and artist Jamie McKelvie is far greater than the sum of its parts. Put them together on a book, and magic happens. 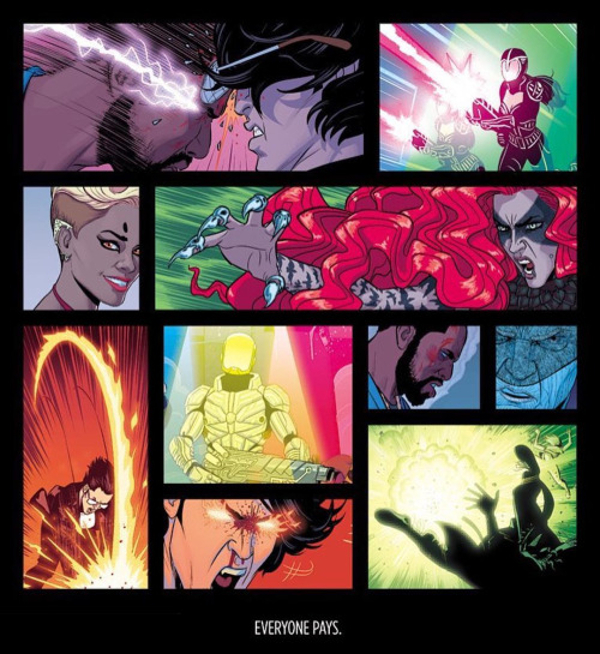 Take McKelvie out of the equation, and things go into decline. 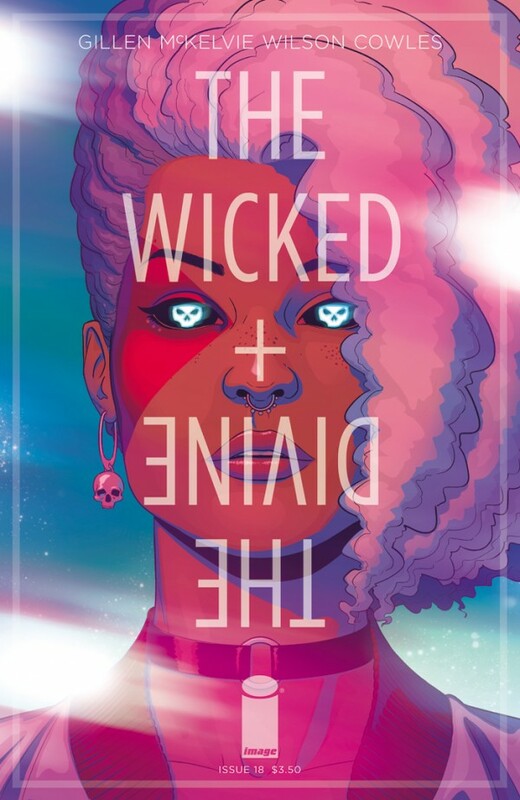 They declined so much on Commercial Suicide, in fact, that I’d started wondering if Wicked + Divine wasn’t just empty pop posturing posing as a story of greater depth. Seriously, this thing is like an old Roy Thomas comic, just with less clear-cut heroes and villains, and better fashion sense. So what makes me think I’ve been selling the book short? Well… It’s mostly because I improved myself as a reader. 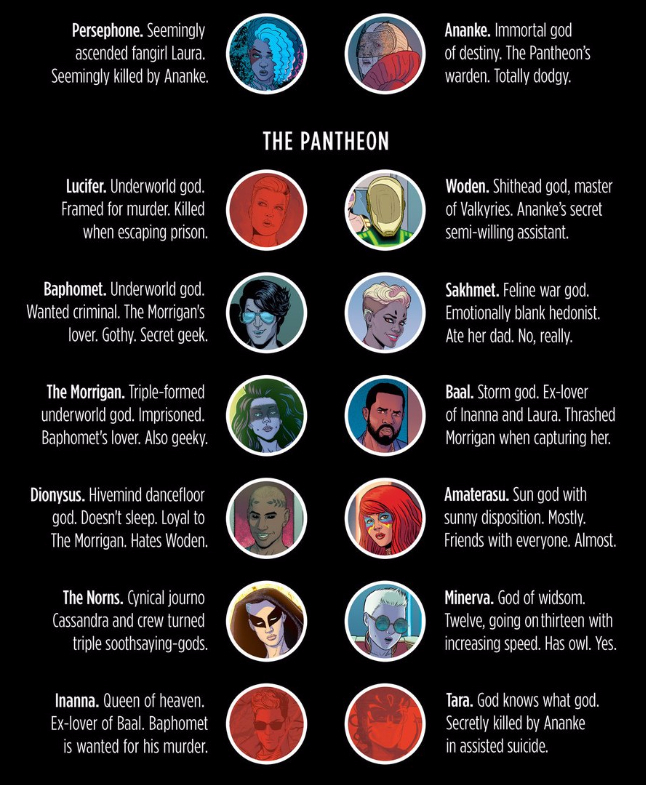 Which is to say, I finally got around to doing the research I’ve been meaning to do forever, and actually read up a bit on all the various gods and goddesses serving as archetypes for our cast here. We didn’t know who all the gods were at first, and I was familiar enough with enough of them that I was able to fake it as they were revealed one by one. I kept meaning to look deeper into things once we had the full pantheon in place, but I just didn’t. This issue opens with a new rundown of the cast, though, a “JLA Roll Call” sort of page with everyone’s head shot in a little circle next to their name and a brief description. And I thought, “Well, that’s convenient,” and went galloping off to Wikipedia. And that, specifically, is what’s got me thinking that I’ve sold the book short. Like I said before, I knew enough to fake it. Most of the Western gods, I had at least a passing familiarity with, even if I wasn’t 100% clear on the exact roles of them all. I also knew who Amaterasu was (Japanese sun goddess), and that Sakhmet was Egyptian. But Inanna? I’d heard the name before, but didn’t know the first thing about her. And Baal? Wasn’t he a demon or something? Tara? No clue. And, embarrassingly, I thought that Ananke was another Japanese figure, when actually she’s Greek. About as Greek as they come, too, being one of the Protogenoi, the primordial deities who gave birth to the universe before even the Titans were born. And that was just the tip of the iceberg when it came to things I didn’t know about the gods Gillen’s chosen to play with in this book. Getting it all straight makes better sense of the characters and their actions, and adds layers to the series that I didn’t realize were there. Baal, for instance, was indeed a name given to a demon. But before that, it was a name associated with the Semitic storm god Hadad. “Baal” just meant “lord,” though, and early Hebrew writings also use it in reference to Yahweh (the god of the Jews, Christians, and Muslims). The confusion over the name caused later scholars to identify Baal as some kind of false god, and eventually (like so many other pre-Christian deities) another name for the Devil. …it’s kind of like one guy punching himself in the face. Or head-butting. Whatever. Of course, Wicked + Divine also prominently featured Lucifer in its early issues, making that three different stand-ins for the Christian Devil. That idea of threes plays out again and again here, with three goddesses of fate, three gods of war, three sun gods, three gods of love and fertility, three gods of knowledge and wisdom, three lords of the underworld, and etc. …still strikes me as a singularly poor reading of that particular god. Sounds like it’s time for a re-read, then. Going back, armed with my new knowledge of the gods, should prove interesting. Can’t wait to see what I’ve been missing. And considering how much I’ve doubted the book, it seems like the least I can do. I suppose an argument could be made that Gillen should have spelled all this stuff out a bit more, so his readers didn’t have to do research to appreciate the finer points of the story. But that’s not an argument that holds much weight with me. I understood the story well enough before I spent an hour on Wikipedia (an hour, I might add, that I really enjoyed). And once I spent that hour, doing the work necessary to understand the book better, it started living up to my (admittedly high) expectations. That’s not a flaw to my way of thinking. It’s a bonus. This one was a surprise. I honestly might not have bought it if I’d had more funnybooks to read. But it was a slow week, so I was poking around for stuff, and the art caught my eye. I wouldn’t call Ian Bertram’s work “pretty,” exactly, but it is captivating. Weird. Fun to look at. And very much appropriate for this book. 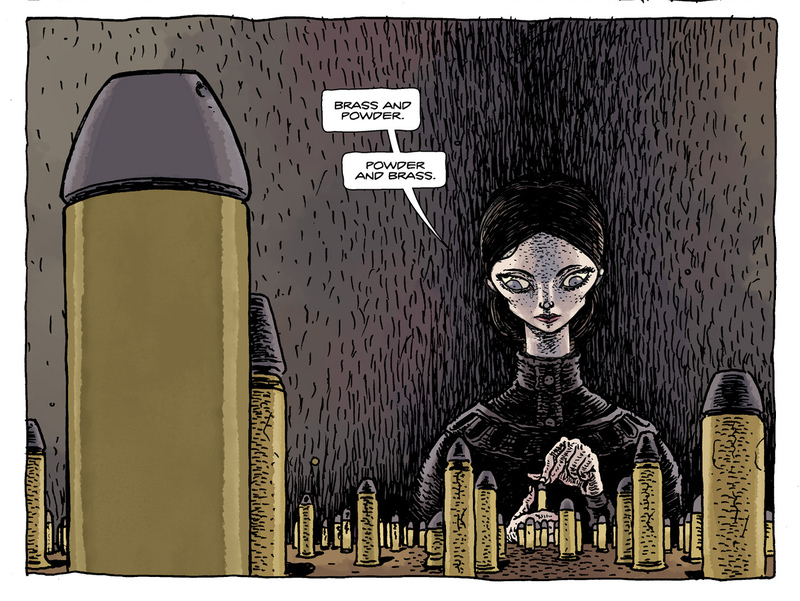 Because this is a comic about one of my favorite historical edifices: the Winchester Mystery House. The story goes that, after the tragic deaths of her husband and daughter, Sarah Winchester, heir to the Winchester rifle fortune, went a bit mad. She imagined that she was haunted by the spirits of all those who were killed with her family’s guns. The only way to ward them off, she believed, was to confound them with endless passageways, and by keeping the hammers of her builders going, round the clock. So for 38 years the house slowly grew, filled with twisting halls, stairs leading only to blank walls, and doorways to nowhere. It’s a genuine curiosity, still standing today and open to tourists, a monument to one woman’s madness. …and the men she hired to do the work. 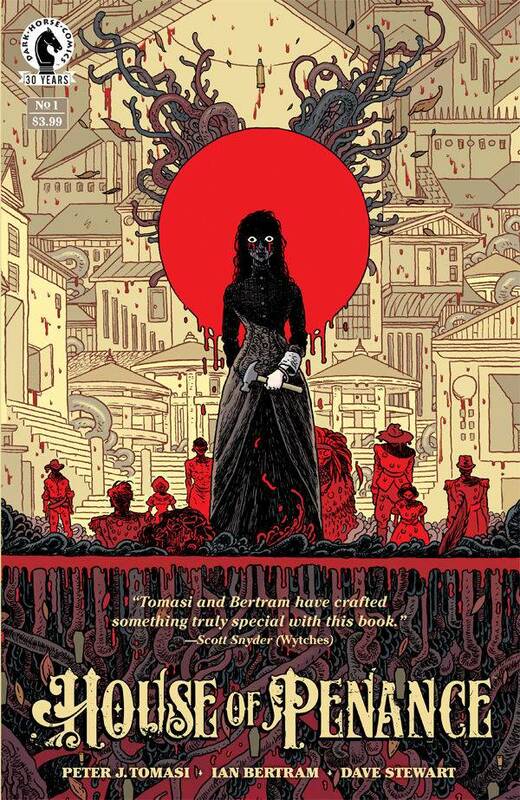 Peter Tomasi’s story is highly fictionalized, I’m sure, but he’s woven a compelling tale. This first issue is mostly set-up, introducing the situation as I’ve explained it above, and bringing a bad man into the mix: Warren Peck, fresh off the slaughter of a small Native American tribe and nursing a near-mortal wound of his own. I have no idea where it’s going next, but I’ll definitely be back for more. The art, the madness, and the overall spooky tone are more than enough to guarantee that.